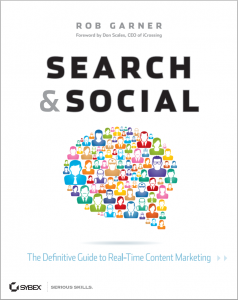 Search & Social: The Definitive Guide to Real-Time Content Marketing is the leading guide to integrating search engine optimization with social media marketing to create powerful content marketing strategies that resonate with real audiences in real time. Written by Advice Interactive Group Chief Strategy Officer Rob Garner, this book is considered one of the foundational publications for the modern marketing professional. Love the book? Purchase the full text from Sybex!